The influence of histamine (1 and 8 μg/kg) and sodium hypochlorite (SH; 5 and 20 mg/l) on the course of free radical processes in the spleen of rats on the 1, 7, 14 th day of the experiment, and also after the rehabilitation period (21 day). It has been established that histamine in both concentrations reduced the content of hydroperoxides by about 50 %. At a lower dose, the accumulation of TBА-reactive products slowed down during the experiment, while for higher such an effect was detected on 1 day , and the opposite – on the 7th. During this time, the activity of superoxide dismutase and catalase significantly increased (by 108 and 19 % respectively). he simultaneous injection of histamine (1 μg/kg) and SH in animals at a lower concentration resulted in the recovery of TBA-reactive products to normal at the initial stage of the experiment and after 14 days, however, their 7th content decreased by 20 % relative to the control values. 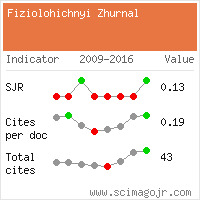 Comparing this figure with a group of animals that were given histamine only (a 40 % decrease in accumulation relative to normal), it was higher. SH and its combined action (20 mg/l) with biogenic amine did not cause tread influence on free radical processes. Thus, at low doses of histamine and SH, the latter adjusts the parameters of the prooxidant-antioxidant state of the spleen, which is a positive effect. Naumova OA. Syndrome, low tolerance to histamine. Kinder Doc. 2013;3(24):44-50. [Ukrainian]. Dale MM. Immunology Guide. M.: Medicine, 1998. [Russian]. Chekman ES. Clinical pharmacology of antihistaminic drugs. Med of railw transp of Ukr. 2002;2:58-61. [Ukrainian]. Petrov SE. Application of sodium hypochlorite in clinical toxicology. Dissertation for the degree of Doctor of Medical Sciences. Moscow; 2005. [Russian]. Bishko OI, Harasym NP, Sanahursky DI. The system of antioxidant defence in liver and kidneys of rat at influence of histamine and sodium hypochlorite. Exper Clin Physiol Biochem. 2014;3:33-43. [Ukrainian]. Komarenko VI, Terekhov AA, Vorobyova AP. Investigation of the role of H1-receptor responses in rat liver portal vessels to histamine. Cherk Nat Univ B Khmelnitsky Biol Sci Series. 2008;128:54-8. [Ukrainian]. Nesterova LA, Smyrova EA, Manuhin BN. Description of fastening of specific blocker [+N]-hynuklidinilbenzylat M-cholinoreceptors of cortex brain membranes of rats. Lect of Acad of Sci. 1995;343(2):268-71. [Russian]. Oleksiuk NP, Yanovych VG. The activity of pro- and antioxidant systems in the liver of freshwater fishes in different seasons. 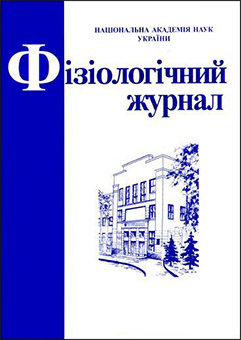 Ukr Biochem J. 2010;82(3):41-8. [Ukrainian]. Timirbulatov RR, Seleznev EI. Method of increase intensity of free-radical oxidization of lipid components of blood and his diagnostic value. Lab Bus. 1981;4:209-11. [Russian]. Kostyuk VA, Potapovich AI, Kovaleva JM. Simple and sensitive method for the determination of SOD, based on the oxidation of quercetin. Probl Med Chem. 1990;36(2):88-91. [Ukrainian]. Koroljuk MA, Ivanova LI, Mayorov IG. Method for determination of catalase activity. Labor Work. 1988;1:16-9. [Russian]. Moin VM. A simple and specific method for determining the activity of glutathione peroxidase in erythrocytes. Lab Bus. 1986;2:724-7. [Russian]. Kolisnyk MI, Kolisnyk GV, Nidziylka E, Vlizlo VV. The active forms of oxygen and their role in cell metabolism. Biol of animal. 2009;11(1/2):59-70. [Ukrainian]. Kurik LM. Physicochemical aspects of singlet-oxygen therapy in the treatment of pathological processes. Ukr Pulm J. 2006;1:66-8. [Ukrainian]. Bishko OI. Histamine and histamine receptor blockers. Structural and functional aspects. Visn Lviv Univ Biol Ser. 2012;60:40-57. [Ukrainian]. Kotsyumbas IY, Velichenko OB, Kotsyumbas GI. Prospects of application hypochlorite in veterinary medicine. L.: TzOB VF "Afisha", 2009. [Ukrainian].